Bad Allocation error using polygon tools. 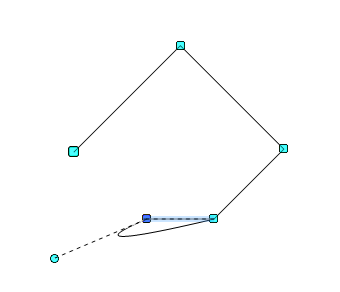 Just started using OpenOffice Draw for making some basic flowchart diagrams, but I've found that I get a 50% reproducible bad allocation error when I drop the curve/angle adjustment point of a polygon shape (filled and unfilled) on top of the point itself. I say 50% because it doesn't *always* happen, and so far it only seems to happen with shapes drawn with the polygon tool, but not the free hand tool. It is difficult to get a good image because when it DOES freeze it happens when you drag the adjustor over the point, not after you let go of the mouse button. I've included examples of the shapes I was drawing, all of these were new blank documents in Draw, this is a fresh installation. I should add that I didn't restart my computer after installing even though it was suggested (just in case that matters). This is where it becomes inconsistent. - I haven't had a crash yet when I choose 'convert to angle' and drop the angle adjustor on top of the point, the crash only seems to happen when using 'smooth transition'. Like I said, this has happened about 50% of the time. Sometimes the angle adjustor will 'clip on' to the point and it will convert back to a straight line with no issue (this is the behaviour I was expecting!) But sometimes it won't clip on and the angle adjustor will just sit on top of the point. The rest of the time Draw will freeze and crash. In this example, I made a shape with the polygon tool and tried to reproduce the crash, but it just wouldn't happen! 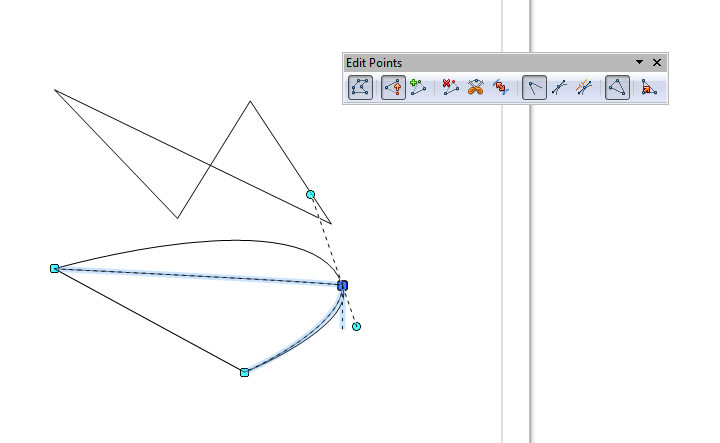 - I clicked on 'split curve' and broke the shape into two lines, then I clicked 'close bezier'. - When I dropped the other adjustor onto the point it froze and crashed, but did not produce a bad allocation error, this is also reproducible. This example was similar, but I did not use 'split curve' to create two shapes. It is not 'difficult' to reproduce but it doesn't seem to happen with definite consistency. - try to drop the curve adjustor onto the point it stems from. It also happens with the 45 degree draw tool, using the method mentioned above. I did not have to close off the shape to produce the error. Re: Bad Allocation error using polygon tools. I don't know whether you have done a search of the forum for that error; if so you may have come across this topic which may help. Alternatively, try starting Windows in Safe Mode and see if you can replicate the problem; if not, something that is loaded in normal mode is conflicting with AOO. Also, you are using an older version of AOO - perhaps an upgrade may resolve the problem. 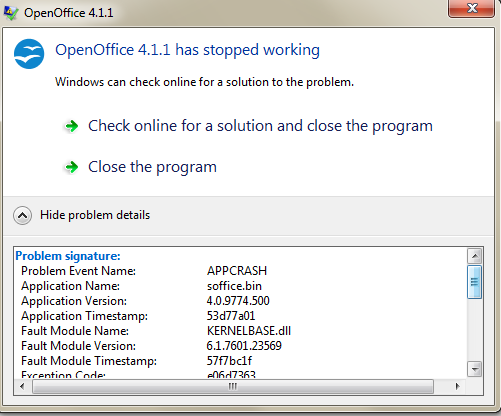 I am getting "Bad Allocation" errors when using the spreadSheet and the Writer features of OO. In my case, they are random and do not seem to have any relationship to size of the workSpace. I have found manually saving about about every entry that would take some time avoids the pitfall of recovery using the last manually saved contents. I do notice that the cursor begins to move slowly and erratically before I get the bad allocation. I have uninstalled 4.1.5 and reinstalled on various Win 10 computers AMD and Intel lapTop or deskTop. I do not have this issue with the Android version of OO. When I get a bad allocation / fatal error, there may be someplace to get more details -- I have no clue. The recovery process for Calc and Writer is an exercise in futility since all input is lost back to the last manual save. Maybe this will help to show that there is some flaw in the OO internals since it is happening in Calc and Writer. 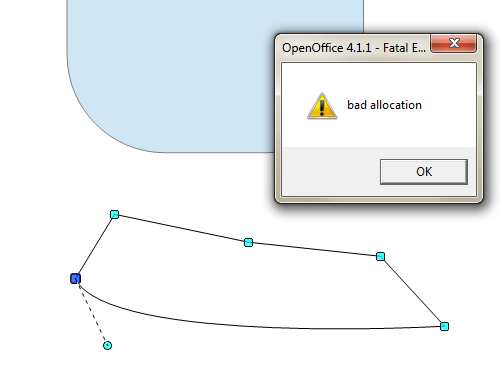 I failed to mention that bad allocation alertBox is all that I get. It disappears about as quick as it appears. I have to go to the file, on disk, and relaunch the file I was using and I get the recovery notice and then when it completes I am back to the point where I last manually saved. The auto save is virtually worthless!